When I first heard that Might & Magic was getting a new installment, I was pretty jazzed. I love Might & Magic, and I initially thought we’d be getting a Skyrim-caliber modern classic… Though my expectations were completely changed when I saw the initial art and read into the announcement a bit more, I’m pleased to say that Ubisoft Barcelona Mobile’s new offering is a lot of fun in it’s own right, and is a must-play for people who already find themselves obsessed with mobile strategy RPGs. Even if you’re not a fan of the fast-paced, strategic battle RPG genre (like me), there’s a lot to love about Elemental Guardians. The lore of the Might & Magic franchise provides a solid foundation that this game builds upon, and the colorful art style tows a three-way line between cutesy, cool, and charming – and the balance is equally attractive and accessible. Elemental Guardians puts you in the robes of an apprentice Wizard at Akadimia, the school of magic. The early version of MMEG that I had access to allowed some basic character customization (which was really nice), but there’s even more options that will release when the full game drops (y’know, today). Battles are a lot of fun. 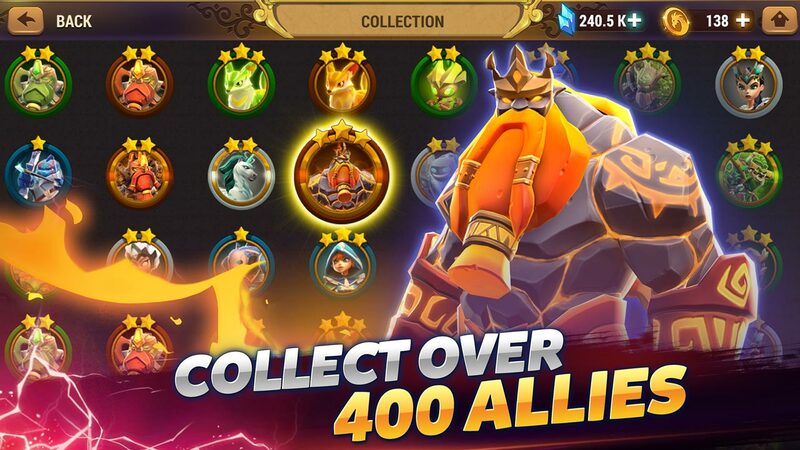 The object of the game here is simple: collect fantasy Creatures divided up into different element categories, and train and evolve them into powerful new forms. Ring any bells yet? The different elements provide a layer of strategy to battles, as you can see what you’re going to be fighting beforehand and prepare your guardians accordingly. There’s over 400 creatures in the game, which range from super generic to unique and interesting. I honestly wasn’t crazy about the names of most of the creatures being literally just what they are (i.e. “Goblin” “Paladin” “Dragon”), and the fact that there are multiple elemental types for each creature makes it feel like the roster is a bit padded. It’s a huge bummer to get a duplicate creature out of the game’s soul stones (think Pokéballs you’re rewarded with that already have a mystery creature inside), but getting lucky enough to unleash a powerful and unique creature is pretty awesome. MMEG falls victim to a lot of different trappings of “freemium” mobile RPGs, the worst of which are the game’s crowded UI, virtually absurd amount of different currencies masked as collectibles and reagents, and the overwhelming amount of daily tasks, missions, and events. Right off the bat, there’s simply an insane amount of activities to do, and it feels like an obligatory chore to swipe through each menu in the game to make sure you’re not missing anything. The most frustrating part about this is the fact that some missions and achievements live in different places, and you’ve got to manually claim rewards from both. This means if you complete a challenge and forget about it – you might have unclaimed rewards nestled in a menu for a little while if you aren’t diligent about it. Granted, fans of this genre will already be used to this structure, so it might not be an issue. MMEG doesn’t do a whole lot to ease curious new fans into these tropes, though. There’s lots of cool creatures in MMEG, but many are recolors – which kinda stinks. Might & Magic: Elemental Guardians is at it’s best when you’re in the heat of battle, and at it’s worst when slogging through the seemingly endless menus and lists. As a freemium game, you probably should go into this expecting to see ads for in-game promotions, events, and specials – but MMEG does a good job of not beating you over the head with it. The battles are fun and can get pretty challenging on the higher difficulties, but the game’s “fast forwarding” and “auto-battling” features let you literally set-and-forget your mobile device while the computer does the work for you, which really took me out of feeling like I was playing a true turn-based RPG. I tend to leave those features switched off, but if you’re just trying to collect some currencies and make quick progress, I guess that could be useful for you. 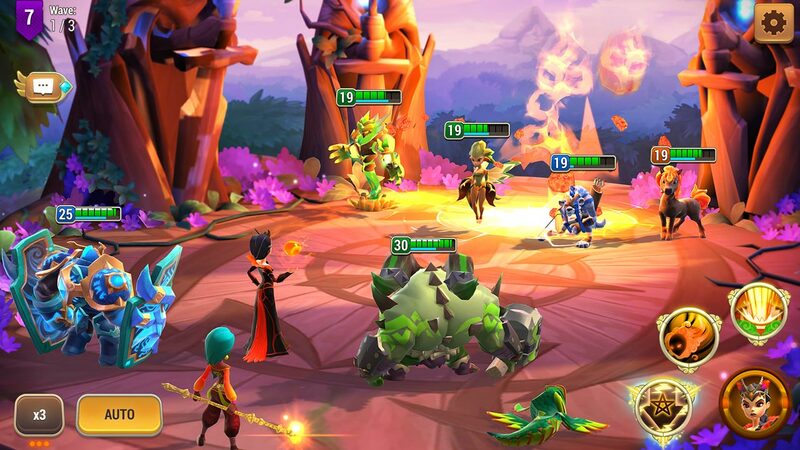 Overall, Might & Magic: Elemental Guardians is a fun, colorful mobile strategy RPG that does enough to separate itself from the pack, but still has some unfortunate hallmarks of it’s App Store brethren. I can tell I’m going to enjoy playing this for a while, because it’s a great quick-fix for turn-based RPG fans, but I can’t see myself getting truly “sucked in” to the game’s progression and evolution system like many others might. The Good: Fast, fun, straightforward turn-based RPG battles make MMEG a delight to pick up and play. Unlocking unique Creatures is exciting. The Bad: MMEG’s charm isn’t enough to help it rise above the clunky tropes of other games in it’s class, and that’s a shame. The Verdict: RECOMMENDED. If you’re a strategy RPG fan, download this right now. If you’re new to the genre, give it a try anyway, but make sure you know what you’re getting yourself into. Love WGG? Support your boys! Check out the official WGG Shop right here, follow us on Twitter, and subscribe to us on Spotify and Twitch! Also, if you’re looking for a high-quality monitor mount – use code 10WICKED over at Echogear to get 10% off your purchase!